Description of "The Portrayal Of Lord Krishna in Narayaneeyam (eBook)"
Melpathur Narayanan Bhattathirippad wrote "Narayaneeyam" which could be described as the condensed version of Bhagavatham in verse form.This book is a translation of the hundredth chapter of Narayaneeyam which describes Lord Krishna of Guruvayur as envisaged by Melpathur Bhattathirippad. Rani Premkumar is a technology-media law consultant, writer, freelance lecturer and mediation slash conflict resolution professional. 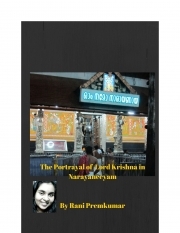 Reviews of "The Portrayal Of Lord Krishna in Narayaneeyam (eBook)"